Here is the 'official' OcUK rig/cruncher gallery. Fill it with glorious images of your hardware. Simple rules: Please keep the posts in the thread to pictures, specs and comments (by original poster), so it doesn't get out of hand. That's it. Humorous pictures, and pictures if FUBARs are absolutely encouraged, but remember this is a family show! 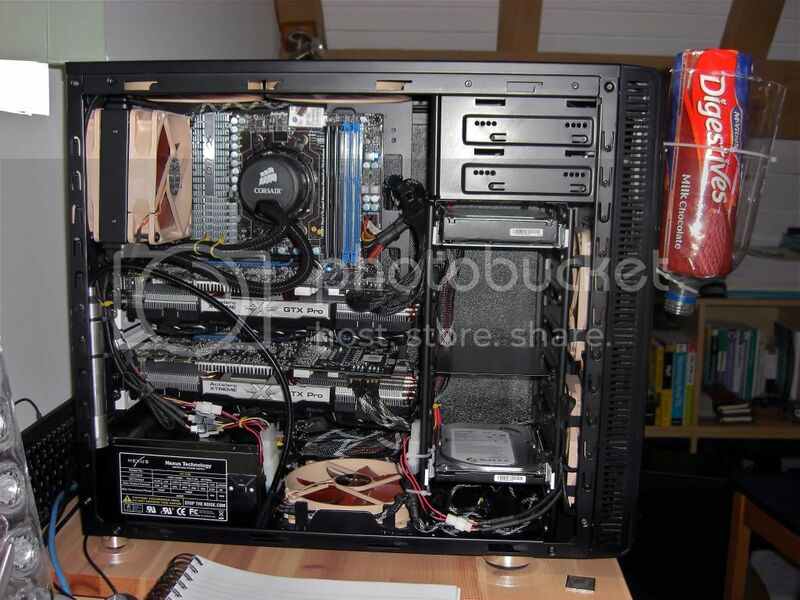 Same specs both machines 1 has 3 x gtx 470 and the other 3 x gtx 480. May as well post up a couple, some of them are not very exciting. The camera on my phone is not great unless there is good natural light as you can see from the last 2 pictures. 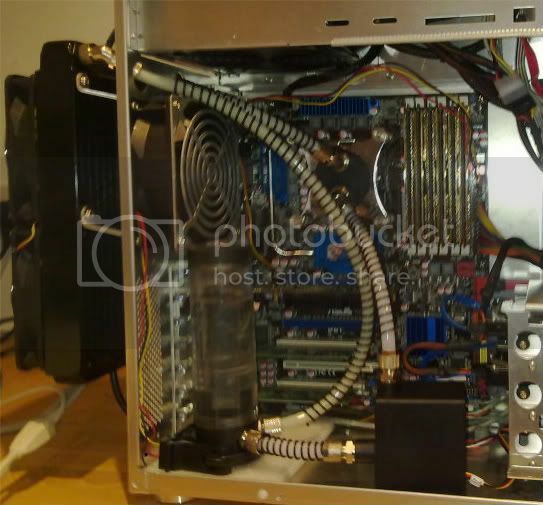 Dual Xeon Dual Core 5160 3Ghz, 8GB ECC DDR2, 74GB 15k RPM SAS boot and 1TB storage, GTX 260. Dual Xeon Dual Core 5150 2.66Ghz, 2GB ECC DDR2, 160GB drive, Quadro NVS 440 (similar to a 7100GS). me and Nath were discussing the lack of a thread like this yesterday! You can see from the client log files just how unstable it is. Mars: My general purpose home machine. i7 920 @ 3.6GHz (normally at 4GHz when under water). 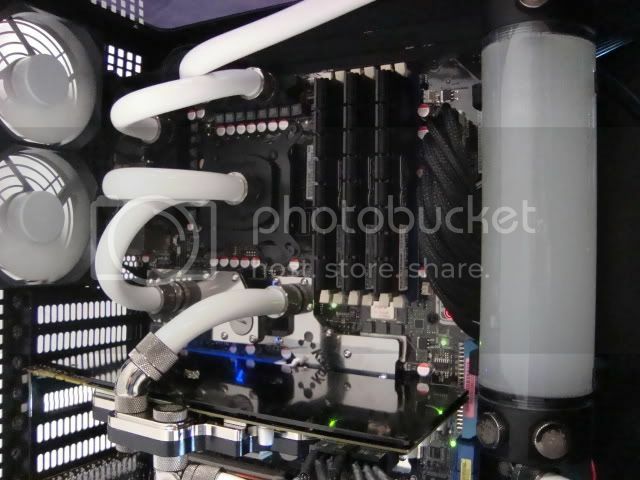 The res for the cooling loop split and all the fluid leaked out. Luckily, it was mounted outside the case and no damage was done but I haven't got round to fixing it yet. I'll be doing a bit of rearranging when I get back from work next month. Haven't decided exactly what I'm going to do but I think the Gigabyte board in the photos rig will be transplanted into a new case with one or both of the 295s (or maybe even something else ). The Gigabyte board is a better clocker and with good cooling, it'll do 4.2GHz+. That'll be the new gaming rig and the current gaming rig will become the photo editing rig. The Q6600 in the bedroom is Fubared just now (suspect PSU but not sure) and I don't have time to sort it before I go back to work tomorrow. 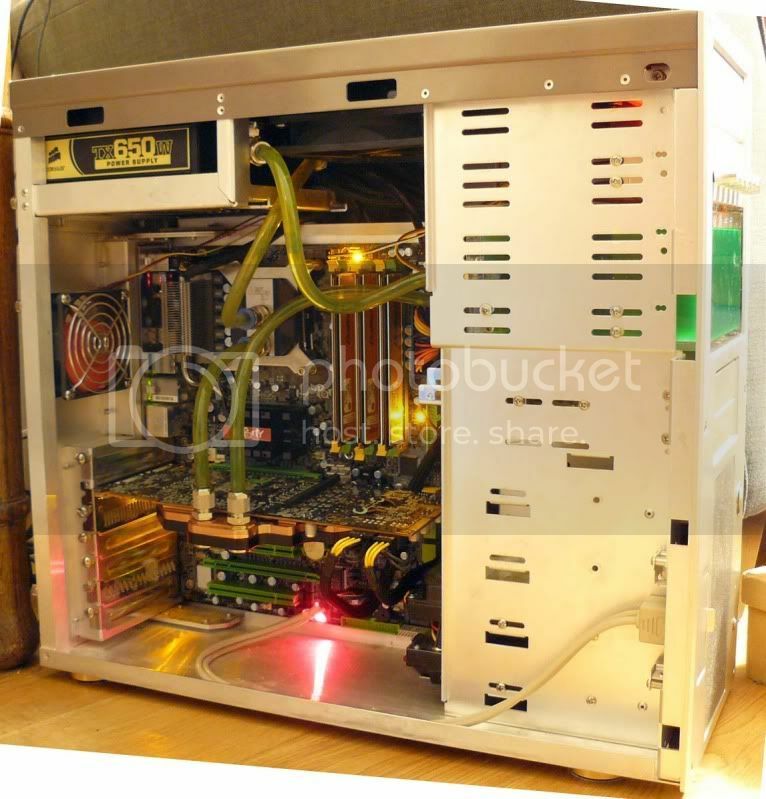 It normally runs at 3.4GHz and has an 8800GTX as well. The media rig in the living room runs a Q6600 @ 3.4GHz. 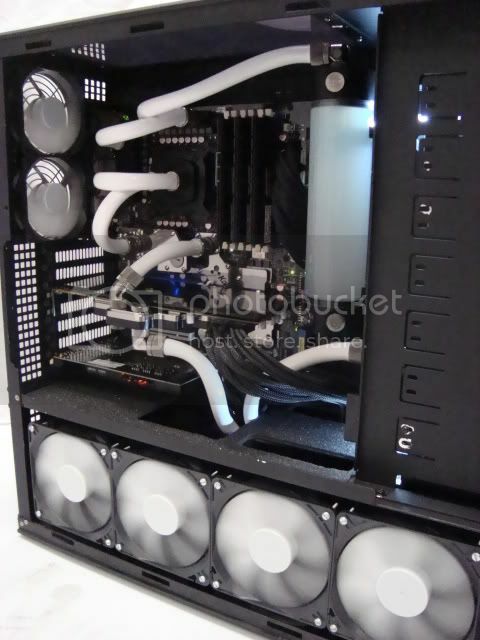 Cooling: 1 x RS240 Rad, XSPC Delta v3 block, EK Res, EK pump, 10/8mm tubing and fittings. Fans: 2 x YateLoon 120x25mm on the rad, 1 x 120x38mm YateLoon on rear and 1 x 120x25mm YateLoon on the front intake.